If you hit F3 while playing Minecraft, an overlay appears. Some of the items, such as fps, x, y, and z are obvious, but I'm curious about some of the other values. What do they all represent? The bar graph charts frame rate over time inversely (e.g., higher spikes = lower frame rate). Green plots are when your frame rate is 60 FPS or higher. Pressing the 1-9 keys will show sub-divisions of the numbered slices of the pie chart (in addition to switching items as usual), and pressing 0 will go back up. 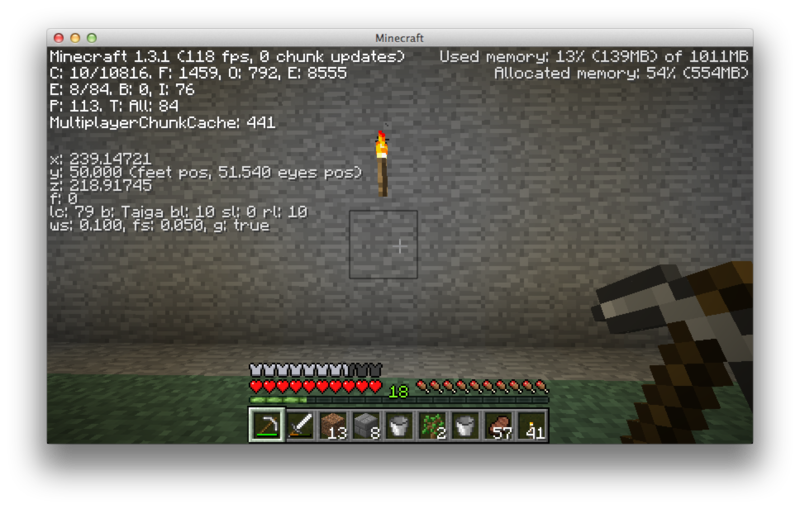 A chunk, if you're not familiar with the term, is a section of the world, equal to 16x128x16 blocks. Given the context in which it appears in RenderGlobal.java, I believe "renderers" refers to a single block. Under the Minecraft coordinate system, X and Z are the horizontal axes and Y is the vertical axis, which confuses players used to other coordinate systems. There is a very good video I have of this. It explains the F3 menu / debug screen. Does length dilation affect the Y axis in the Nether? What version of Minecraft am I playing? What's the goal of Minecraft and what can users achieve in this world? What can I eat in Minecraft? Minecraft: What is the name for the texture of the bar on the front of the screen during gameplay?